We were up early and on our way Wed. morning for the 8+ hour drive from Galveston to New Orleans. It was a weird day of driving; saw a truck catch on fire and a trailer’s satellite dish fly off the top of their rig. Looks like they forgot to put it done – OOPS! Finally made our way to milepost 880 and the east side of Texas. Wow that is one big state! Arrived at the New Orleans KOA at dusk and got set up. This park was nothing special except for location, location, location and the service was fantastic and the cheapest laundry yet. So, I guess maybe it was a bit special! 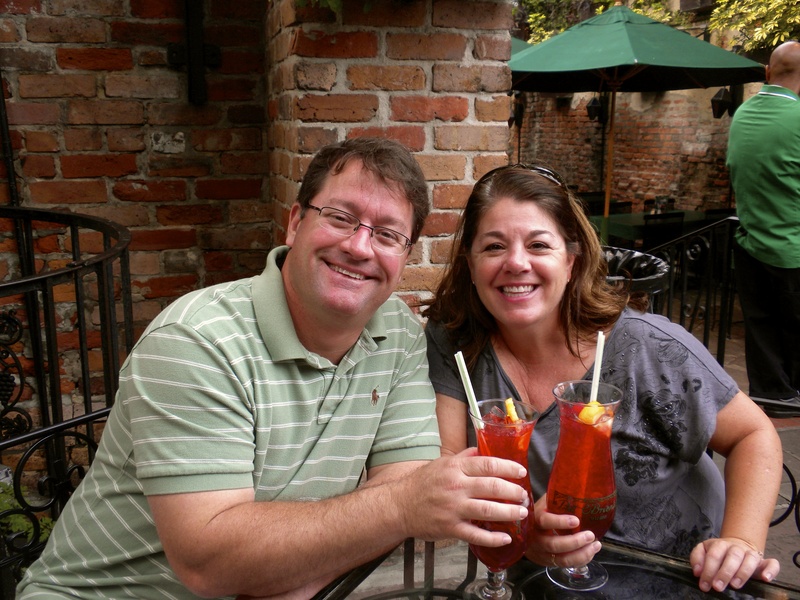 We got settled, then our friend Craig Gambino came to MoHo for a welcome to NOLA cocktail. His home is less than a mile from the KOA, which was perfect! He took us to a local favorite, Copeland’s, for dinner. A great introduction to Cajun food and Craig proclaimed that if we both didn’t put on a few pounds by the end of our stay, then he would not have done his job. Crikey. The next day, our tour guide Craig picked us up and drove us out to the Ninth Ward and Chalmette to see the damage from Katrina. He also took us to where one of his storage units (he owns many in the area) had been devastated and now is just a big empty lot. Hard to imagine that in these areas the water was 12 to 15 feet high. In the Ninth Ward, we saw all of the houses that Brad Pitt is rebuilding in the area. They are modern and stand out like sore thumbs compared to the existing homes that are still there. A pretty cool thing he is doing though. 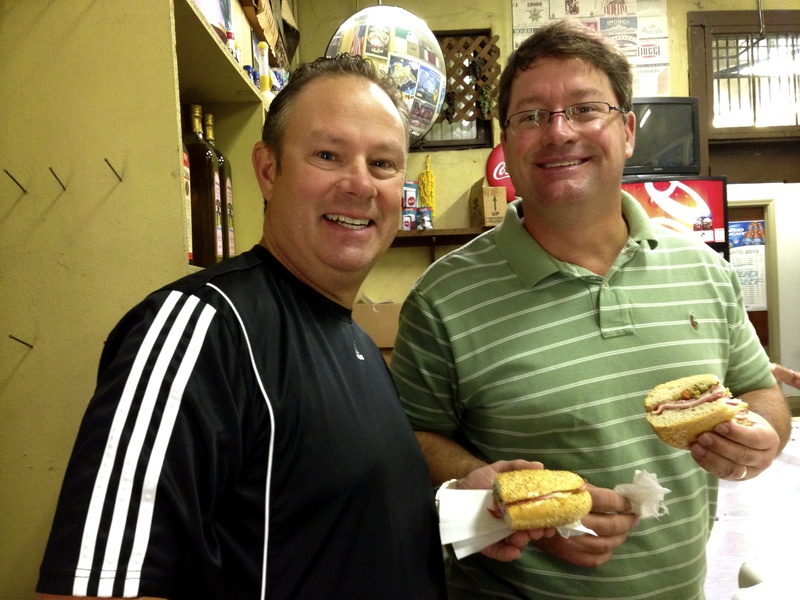 We met Craig’s dad and friend at Rocky & Carlos’ for lunch – a local southern joint with classic New Orleans food. It was delicious, but boy I am not used to eating that much food, especially for lunch! 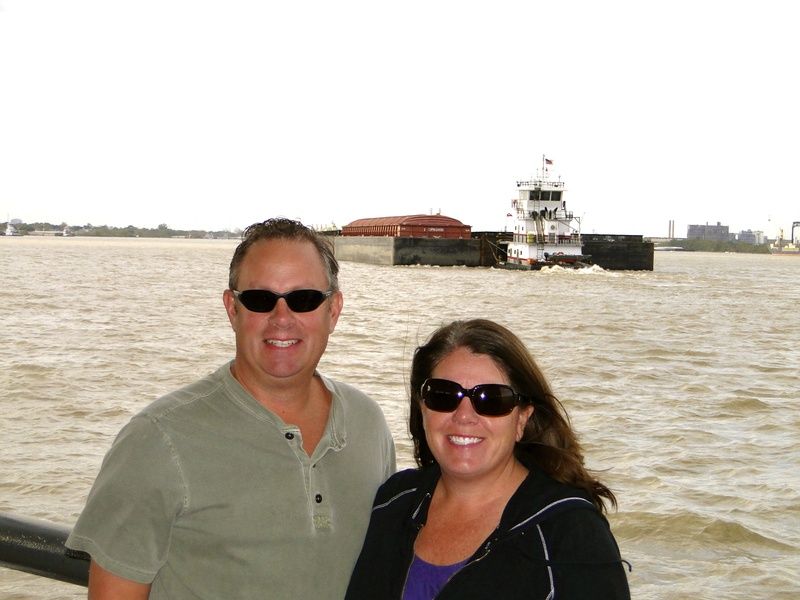 We then took a ferry ride over the mighty Mississippi and drove around a bit more. Craig and his wife Kim had us over to their house for dinner that night. They tried to find crawfish (Mike’s fave), but it wasn’t in season. 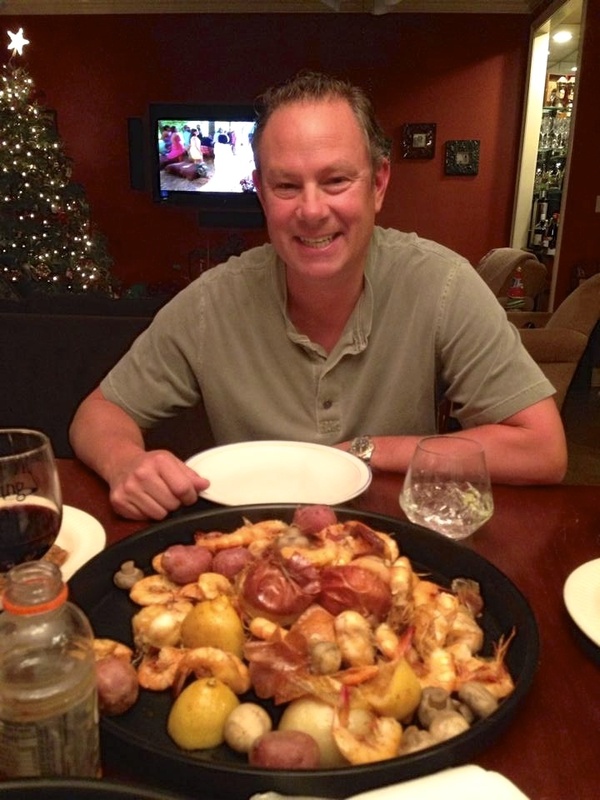 Instead, they did a shrimp boil with all the fixins. As usual, Mike was the last one eating! He just loves that Cajun spice flavor! 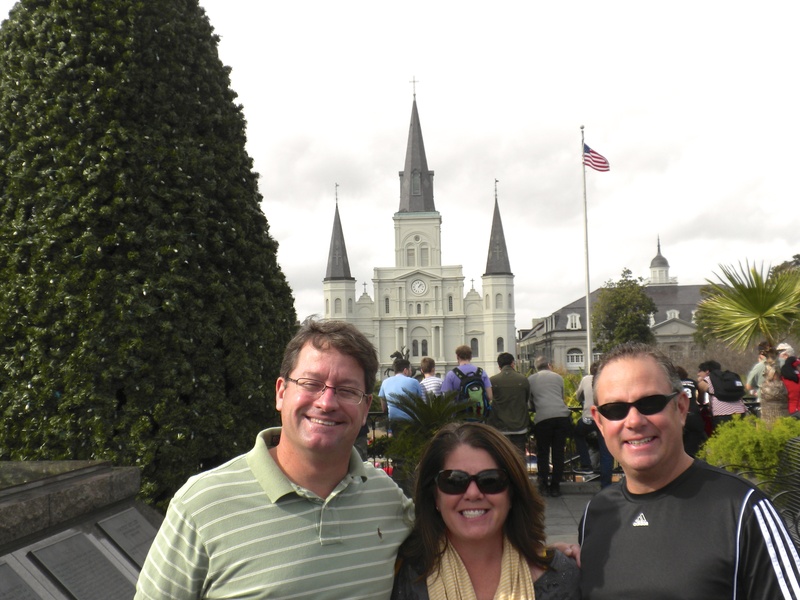 On Friday, Craig picked us up around noon and we headed down to the Quarter. Went straight to Central Grocery for Muffuletta and a stuffed artichoke. This is one of those landmark places that only the locals seem to know about. My motto these days is to try everything. I don’t really like olives and it is basically an olive sandwich, but it was tasty! Then we started walking. We lucked out with the weather, sunny and warm. I would even say a bit humid, but Craig did not agree! Stopped in at several places for a beverage…Lafitte’s Blacksmith Shop Bar for a beer, Pat O’Briens for a Hurricane and Hotel Monteleone for cocktails where the bar rotates a la the Space Needle. One thing I was infatuated with is the concept of “to go.” If you are not finished with your drink, you can get it in a to-go cup or just stop in and order something to go – classic! As the afternoon and early evening approached the scene definitely got more crowded and lively. Kim came down after work to meet us for dinner at Café Amelie. 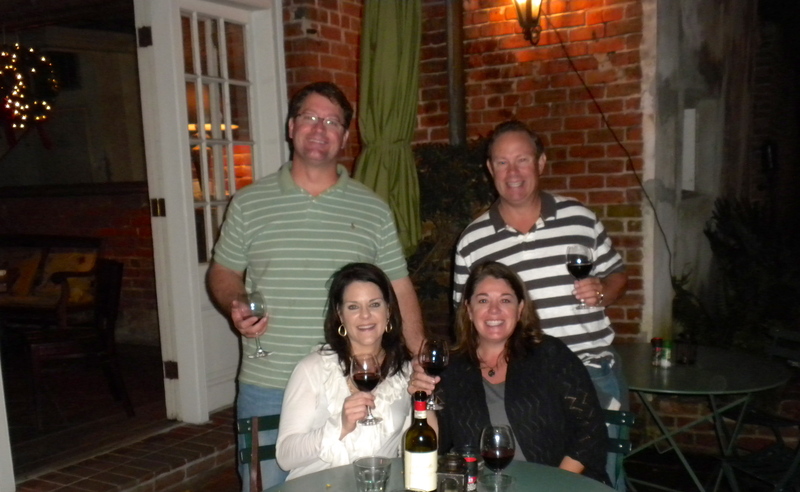 Our friend Joanna who we met in Lodi, CA suggested it and it was nice as Craig & Kim hadn’t been there. A new experience for all of us. We sat outside in the courtyard. Great ambience and delicious food! We were actually the last ones there. 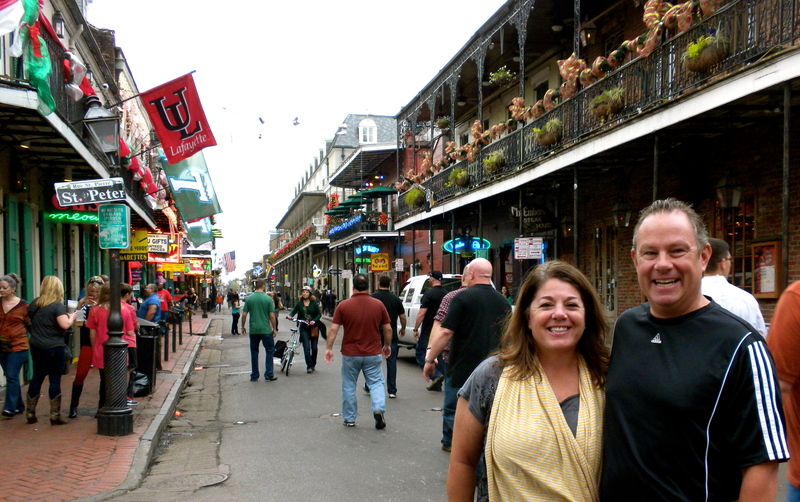 We headed back to Bourbon Street to walk around. The scene was in full force, but apparently this was nothing compared to big weekends like Jazz Fest or Mardi Gras. It seemed pretty crazy to me. 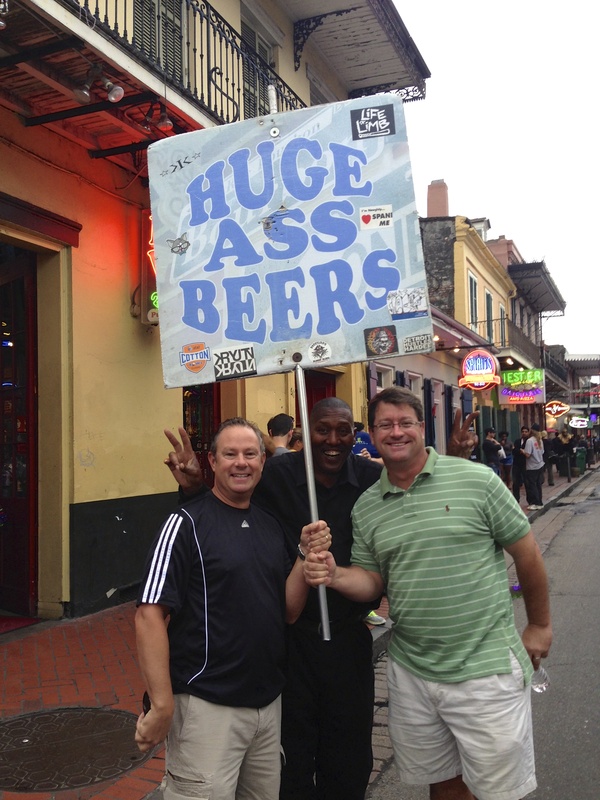 There were a lot of ‘Ragin’ Cajuns’ there for the football game the next day. Our evening was topped off with a stop in a bar where Craig paid for Mike to sit in a dentist chair for a fireball shot from a very “friendly” server (see pic below). A site to see and quite entertaining for all of us. One more ‘to go’ beer and time to head home. We were in bed by midnight. A LONG day, but so fun! I had a much needed hair appt on Sat morning – thanks Kim for arranging! 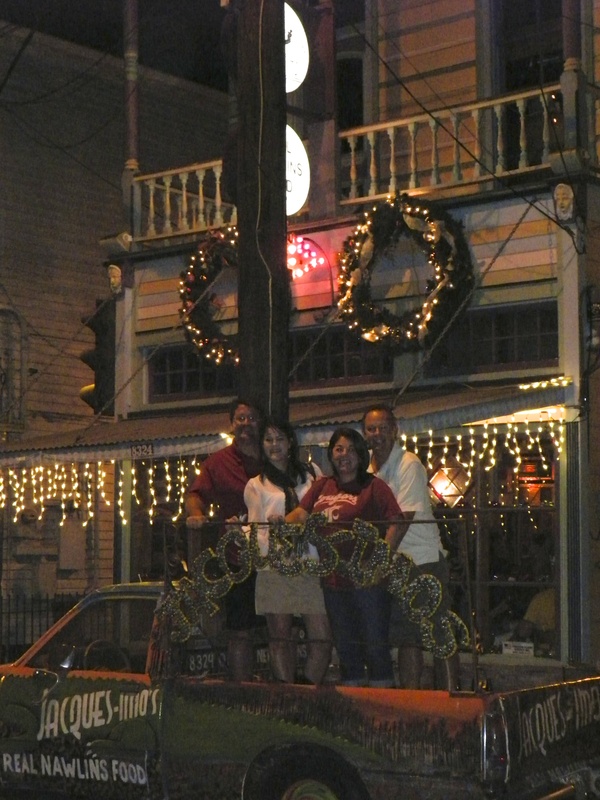 Then Craig & Kim picked us up to head to Cooter Browns Tavern to watch the Coug bowl game complete with Bloody Mary’s and lots of fried food. It was fun until the Cougs absolutely self imploded and lost. Brutal. After a bit of sulking and bitterness on my side, we headed to one of their favorite places, Jacque Imo’s for dinner. A very random, eclectic place and one of the hottest spots in town. I had a fireball shot to calm myself and we lucked out getting a much-coveted table in the bar. Craig’s sister, Susan had joined us as well. Craig ordered a variety of appies/dishes that we all could share. The most random was a shrimp and alligator cheesecake (not a dessert). And yes, I did try it! 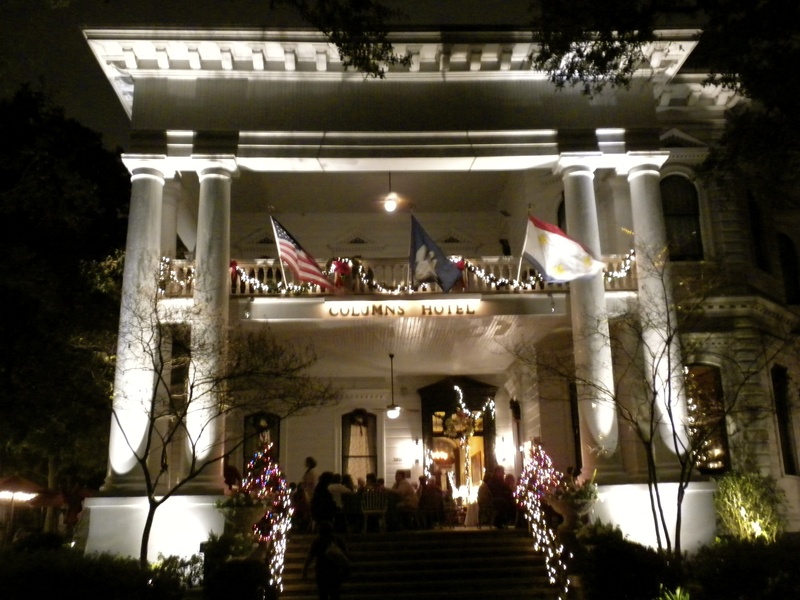 After that we headed uptown to see all of the big mansions decorated for Xmas. Beautiful. Stopped at the Columns Hotel and sat outside for a round of cocktails. A great way to end our time here. We said goodnight and our goodbyes since we would be on the road the next morning. Woke up to strong rain and wind and feeling tired. We really lucked out on weather for our time in New Orleans. A very big thanks to the Gambino’s for making our time here so special. We invaded them at a tough time, the kids finishing exams, busy at work, their daughter’s bday and of course the Holidays with family in town. Needless to say they had a lot going on, but they took the time to host us and show us a great time for 4 days and nights! We so appreciated this. Seeing the city with locals makes for a much better experience. p.s. Craig did his job! We both feel a bit puffier than when we arrived. 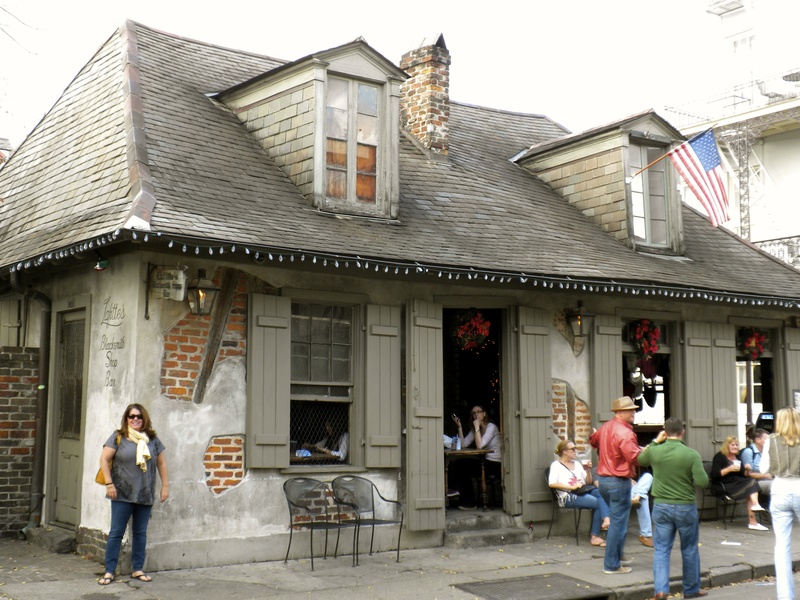 This entry was posted in December 2013 and tagged Bourbon Street, Cajun food, Central Grocery, French Quarter, Hurricane Katrina, Jacque Imo's, Mississippi River, Muffuletta, New Orleans on December 23, 2013 by Traci. Merry Christmas- much love, be safe and… Can’t wait to read the future novel of your journeys together! Was that Snookie giving Craig his shot? Miller looks about as relaxed as if he was having a root canal in that dentist chair! Lol! I remember seeing the Brad Pitt houses when I was in NOLA in 2007 and they really did look out of place, but it’s so cool that he is doing it. I imagine there are a few more now, so hopefully they have a little bit of a neighborhood. It sounds like there is still a lot that hasn’t changed though. It’s really hard to get your head around the devastation, isn’t it? It looks like the journey continues to be amazing. I have to admit though, that as much as I love what you guys are doing, I’m secretly calculating how long it is until you get back… xoxo.